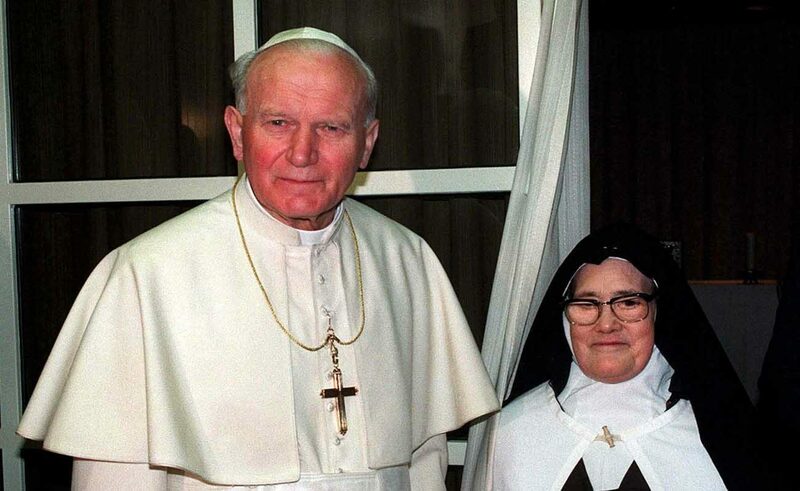 VATICAN CITY (CNS) — Recent popes have had a special affection for Our Lady of Fatima, but no pope’s connection can match that of St. John Paul II. “We cannot forget that he was saved by Our Lady of Fatima from the assassination attempt here in St. Peter’s. This is fundamental and central. It is never forgotten,” Portuguese Cardinal Jose Saraiva Martins, former prefect of the Congregation for Saints’ Causes, told Catholic News Service March 29. Mehmet Ali Agca, a Turk, shot Pope John Paul at close range as the pope was greeting a crowd in St. Peter’s Square on the feast of Our Lady of Fatima, May 13, 1981. Two bullets pierced the pope’s abdomen, but no major organs were struck; a bullet had missed his heart and aorta by a few inches. Given the date of the assassination attempt, the pope specifically credited Our Lady of Fatima with his miraculous survival and recovery. Several months later, he visited the site of the apparitions, the first of three visits he would make as pope to Fatima. For St. John Paul, Cardinal Saraiva Martins said, “Our Lady of Fatima was everything,” and his three visits to the Portuguese town were those of a grateful son to the mother who saved his life. “I still remember — I’ll never forget it — when he arrived at the little chapel of the apparitions where (the statue of) Our Lady of Fatima was,” Cardinal Saraiva Martins recalled. As the prefect of the Congregation for Saints’ Causes from 1998 to 2008, Cardinal Saraiva Martins also oversaw the process leading to the beatification by St. John Paul of Jacinta and Francisco Marto, two of the three young shepherd children, who saw Mary at Fatima. The cardinal also shared a personal friendship with the third seer, Carmelite Sister Lucia dos Santos, who died in 2005. It was Cardinal Saraiva Martins who, two years after Sister Lucia’s death, urged Pope Benedict XVI to waive the five-year waiting period before her sainthood cause could be opened. “The pope was very kind. He said, ‘Yes, you know more about this than I do. We will do as you say,'” the cardinal recalled. Pope Benedict, the cardinal added, was a “great devotee” of Our Lady of Fatima, even before his election to the papacy. Interviewed in his apartment near St. Peter’s Square, Cardinal Saraiva Martins grabbed a copy of part of the interview then-Cardinal Joseph Ratzinger did in 1985 with Vittorio Messori, an Italian journalist. “Before becoming pope, he said: ‘A stern warning has been launched from that place … a summons to the seriousness of life, of history, to the perils that threaten humanity,'” the cardinal read. The special papal bond with Our Lady of Fatima continues today with Pope Francis, who as archbishop of Buenos Aires, was a frequent visitor to a shrine in the Argentine city devoted to her, Cardinal Saraiva Martins said. Pope Francis will visit Fatima May 12-13 to mark the 100th anniversary of the apparitions. Devotion to Our Lady of Fatima is emblematic of the popes of the last century who have “always recognized” the relevance of Mary’s message, particularly its emphasis on faith, conversion, hope and peace, the cardinal said. It is such a reassurance that we have the added weight of these 3 pontiffs, to help give us even more sense of mission, to help spread the message of Fatima. As a member of the World Apostolate of Fatima, as well as The Fatima Family Apostolate International, I am very desirous to do all possible to help inculcate the vital message of Fatima in our children. I have actually just written a book, with FFA as publisher, to do just that. It is titled “Jacinta’s Miracle Veil” and scheduled for release April 24. Anyone wishing information, please inquire by e mail to info (at) FatimaChildrensBooks (dot) com Thank you!